Insomnia is a tricky and complex condition at the best of times. There’s no single medical definition of the term. The National Sleep Foundation for example, tends to describe insomnia in the broadest of terms ie “difficulty falling asleep or staying asleep“. The problem is, insomnia encompasses a huge range of physiological, psychological and emotional issues. And although in many cases insomnia is associated with an identifiable medical complaint, other times the cause is rooted is lifestyle factors, like stress and anxiety. Understandably, many doctors don’t have the resources to deal with patients complaining with insomnia. Most of the time the standard advice you’ll get is to practise good sleep hygiene – the more or less common-sense principles we’ve heard a thousand times – like going to bed at a regular time, not drinking coffee too late in the day… etc etc. If your insomnia gets worse, your doctor might resort to the big guns – prescription sleep meds. Modern ‘Z-class’ sleep meds like Ambien, Sonata, Lunesta might have fewer downsides than the benzos and barbiturates of the past, but they are still only viable as a short-term solution. Plus these drugs have received a litany of complaints in recent years down to the bizarre, sometimes psychotic side-effects they have caused. Understandably lost of people choose instead to opt for non-pharmacological ways to treat insomnia and sleeplessness. Natural herbal remedies, yoga & meditation, cognitive behavioural therapy have all become popular drug-free alternatives for treating insomnia in recent years. But for those looking for even more options for insomnia relief, there’s yet another path to explore – sleep technology. Sleep technology is currently experiencing a boom in popularity. At the CES, the world’s largest expo of consumer technology, a whole section of the exhibition is now devoted to new innovations in sleep-related gadgets and gizmos, ranging from smart beds, to hi-tech pajamas. In the last few years, we’ve also seen a surge in the popularity of sleep tracking, a natural extension of the Fit-Bit led trend in wearable activity trackers. But one of the complaints that has been levied at consumer sleep tracking is that mostly, they are passive devices – ie they don’t do anything to actually improve your situation, other than passively monitor and analyse the way you sleep. Hence, we’ve started to witness more active sleep technology devices enter the market. Some of these products combine sleep tracking/monitoring as part of the offering, whilst others are purely focussed on facilitating relaxation and improved sleep. These hi-tech insomnia gadgets employ a wide range of approaches and techniques from guided breathing exercises to electrical brain stimulation. But the one thing that have in common is that they’re designed to provide a pharmaceutical-free way of tackling the symptoms of insomnia and disrupted sleep. Some of these products aren’t cheap, but we’ve tried to hand-pick the best current offerings to give you a sense of the variety and scope in this new emerging market. Please note, that none of the advice on this page is intended to be a substitute for professional medical help, so if you feel that your sleep problems are seriously affecting your health, please go and visit your doctor. So, here’s our roundup of 6 of the best hi-tech sleep aids for relieving insomnia and restlessness. Enjoy, and sleep well! Winner of a 2017 CES innovation award, 2Breathe uses personalized therapeutic breathing exercises to help you fall asleep. 2Breathe is the invention of father and son team, Dr. Benjamin and Erez Gavish creators of RESPeRATE, an FDA cleared hypertension treatment device used by tens of thousands of patients to lower their blood pressure. One of the side effects of RESPeRATE, was that it was so relaxing that patients fell asleep using it. So the inventors decided to re-engineer the device to help millions of people suffering from insomnia and sleeplessness. 2Breathe consists of a small sensor worn with a strap around your abdomen. When you breathe, every inhalation and exhalation movement is sent wirelessly to your phone which runs the companion 2Breathe app. The software then processes and analyses your breathing patterns, calculating a tailored set of tones to guide your breathing.2Breathe uses patented real-time technology to lengthen the duration of your exhalations, slowing down your breathing rate for optimal sleep. As your breathing slows down, you start to feel drowsy and eventually fall asleep. Once the sensor detects sleep, the app automatically switches off. After each session 2Breathe also generates a report showing your whole session breath by breath. 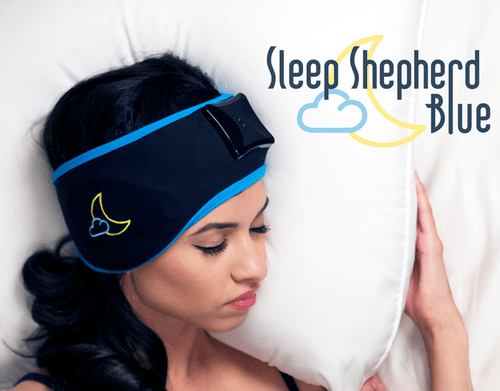 Sleep Shepherd is the brainchild of serial inventor and entrepreneur Dr. Michael Larson. When his daughter was diagnosed with a sleep disorder the Dr Larson put his engineering and product design expertise into practise to design a sleep aid that would be a viable option to the harsh sleep medications doctors were recommending for his daughter. The result was the Sleep Shepherd, now in its second generation, known as the Sleep Shepherd Blue. 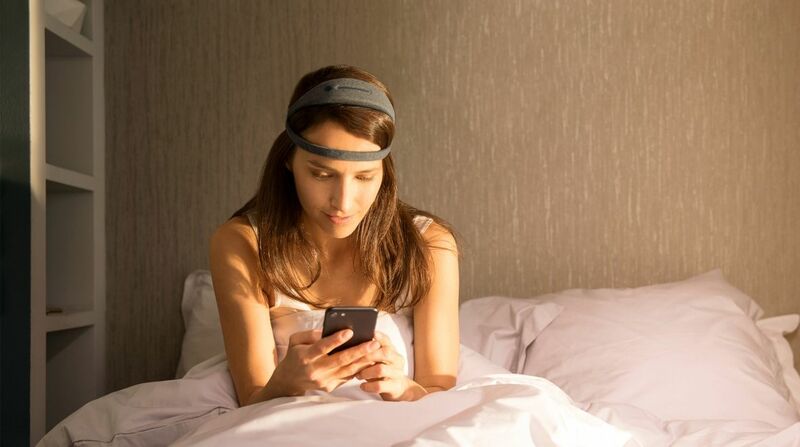 The device comes in the form of a wearable headband, packed with electronics and sensors. Sleep Shepherd works by lulling you into deep sleep using a biofeedback technique known as binaural beats, a simple but effective method of altering your brain state. The science of binaural beats is such that when you play two similar (but slightly different) audio tones into each ear, the brain perceives this difference in pitch as a rhythmic pulse. Studies have shown that by changing the frequency of the pulse, you can actively alter the underlying frequency of your brain wave activity. Sleep Shepherd uses these binaural beats to effectively ‘slow down’ the brain from an active, awake state into a sleep state. This is made possible by Sleep Shepherd’s integrated fabric EEG sensors, which continually monitor your brain wave activity, hence creating the ‘bio-feedback loop’ between the passive sleep monitoring and active binaural beat system. As well as being able to lull you to sleep, Sleep Sheperd Blue also functions as an advanced sleep tracker, providing comprehensive monitoring of your sleep cycles including light, deep and REM sleep. While most wearable sleep trackers use movement or heart rate as a means of determining your sleep cycles, Sleep Shepherd’s EEG sensors are able to incorporate brain wave analysis into its sleep tracking algorithm, providing more detailed data. 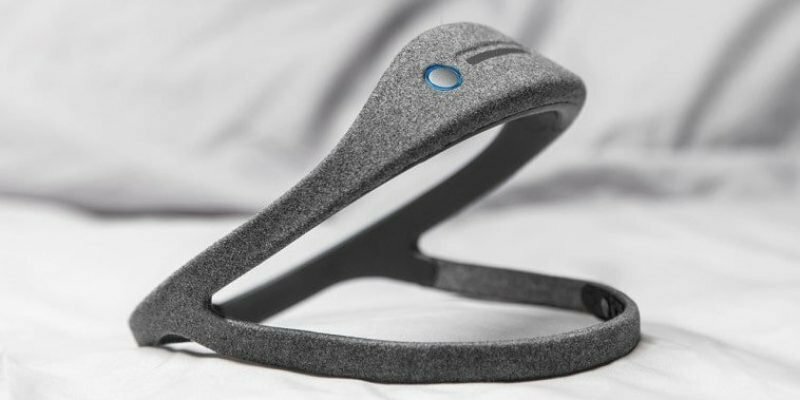 One of the most interesting sleep technology products in recent years is the Dreem wearable headband from French-US neurotechnology company Rhythm. Whilst many sleep wearables are designed from the ground up as consumer products, Dreem began its life as research project between neuroscientists and engineers at Ecole Polytechnique in Paris who were looking into how to stimulate the brain at night and promote deep sleep using sound. 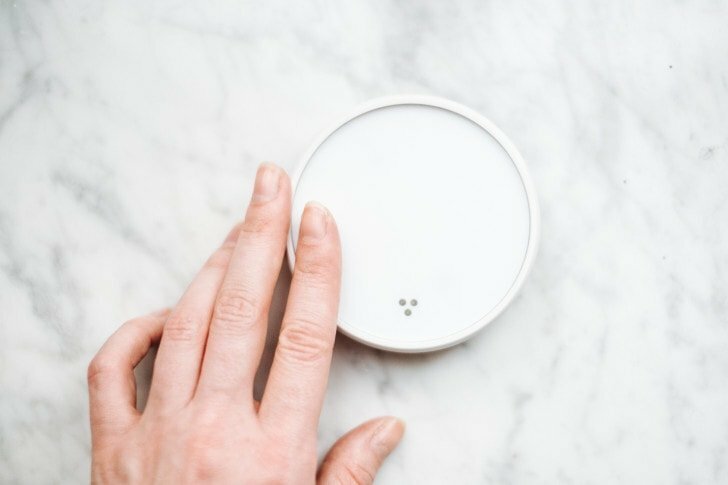 One of the researchers, Hugo Mercier the now CEO of Rhythm, saw the potential and began to develop a product that could take the research from the lab to a consumer product that could bring real benefits to people with sleep problems. Dreem uses a similar, but more advanced implementation to Sleep Shepherd, that is, EEG (brain wave activity) sensors, coupled with a audio-based bio-feedback system which induces sleep. Although Dreem claims to have 95% accuracy compared to the gold standard in sleep monitoring, ie clinical sleep testing or polysomnography (PSG), the focus of the Dreem wearable is not passive sleep tracking, but actively improving your sleep, specifically deep or slow-wave sleep. Dreem achieves its goals by monitoring your brain waves in real time and the stimulating sound at precise moments to sync with slow wave activity whilst you’re asleep. Dreem uses bone-conduction technology whereby sounds are transmitted via the skull, and not the ear canal, meaning you don’t have to wear headphones. As well as the innovative hardware, Dreem utilizes machine learning algorithms to analyse and optimize your sleep data and enhance your sleep experience. Having already trialled the product to 500 users in 2016, Rythm has already gathered an impressive 20,000 nights of highly accurate sleep data which helps Dreem become more effective over time, as it continues to collect more information about a user’s sleep patterns. In addition to the proprietary software, Rythm have also launched an open-source initiative Morpheo employing machine-learning to help better faciliate automatic and predictive diagnosis of sleep disorders. You’d be forgiven for being sceptical about treating illness with electrical currents applied to the brain. Electroconvulsive therapy (ECT) or shock therapy, although still practiced today, gained notoriety in the middle of last century because of overuse, abuse and negative depictions in popular culture. However, in recent years, a related, but completely non-invasive form of electrotherapy, Cranial Electrical Stimulation (CES) has gained popularity to become an FDA cleared treatment for depression, anxiety and insomnia. The Fisher-Wallace Stimulator has been on the market since 1991, and is a small portable electrical stimulation device that provides a drug-free alternative treatment for insomnia, anxiety, and depression. 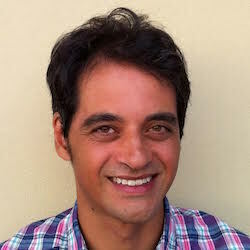 As was the case with electroconvulsive therapy, the medical community still doesn’t have a full understanding of the mechanisms that turn electrical currents into effective treatments, but multiple trials of CES have shown that it helps to trigger endorphin release, including serotonin and other neurotransmitters associated with relaxation, healthy mood and sleep. At only 1000 times less powerful than ECT, Fisher Wallace Stimulator is a low-risk option for insomnia treatment that can be safely used at home. As the design of the product has changed in decades, the controls and functions are simple and uncomplicated. The device, about the size of a TV remote control, is powered by 2 AA batteries. The current is delivered to your skull by attaching two sponge electrodes to your temples with the supplied elastic headband. To operate, simply turn the unit on and leave switched on in one of two current settings. After 20 minutes the device switches itself off. The makers recommend using the Fisher Wallace Stimulator twice a day at the low 2mA setting. If after 2 weeks there’s no noticeable change in your sleep, the current can be raised to the 4mA setting. The SR Delta Sleeper generates a weak electromagnetic field to induce sleep. If you still not convinced about the idea of electrotherapy but you’re open to alternative methods of treatment, you might be interested in electromagnetic therapy. The idea of harnessing the natural healing powers of magnetic fields goes back to antiquity. The discovery of electromagnetism – ie the interaction between electrical current and magnetic forces – created even more avenues of exploration. These days, electromagnetic therapy exists mainly outside of conventional medicine, and is viewed as an ‘alternative therapy’ sometimes going by the name of bioelectricity, magnetic field therapy, and magnetic healing. One of the most interesting branches of electromagnetic therapy is a technique known as Pulsed Electromagnetic Field technology of PEMF. In the past PEMF has been widely used to help heal bones fractures, but in recent years it has been adopted as a technique to improve sleep. 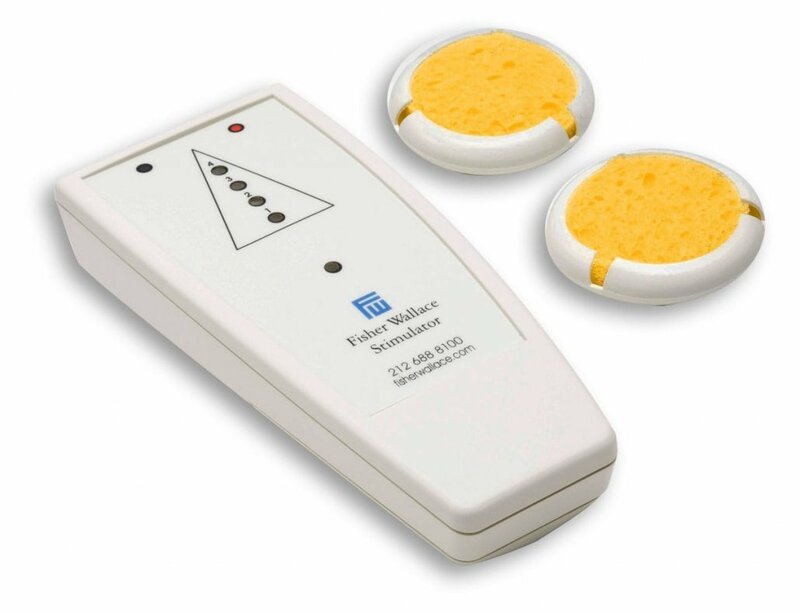 What distinguishes PEMF from electrotherapy techniques such as cranial stimulation, is that instead of applying an electrical currently directly to your body, the PEMF device generates an electric field in or around your body with the aid of magnets. 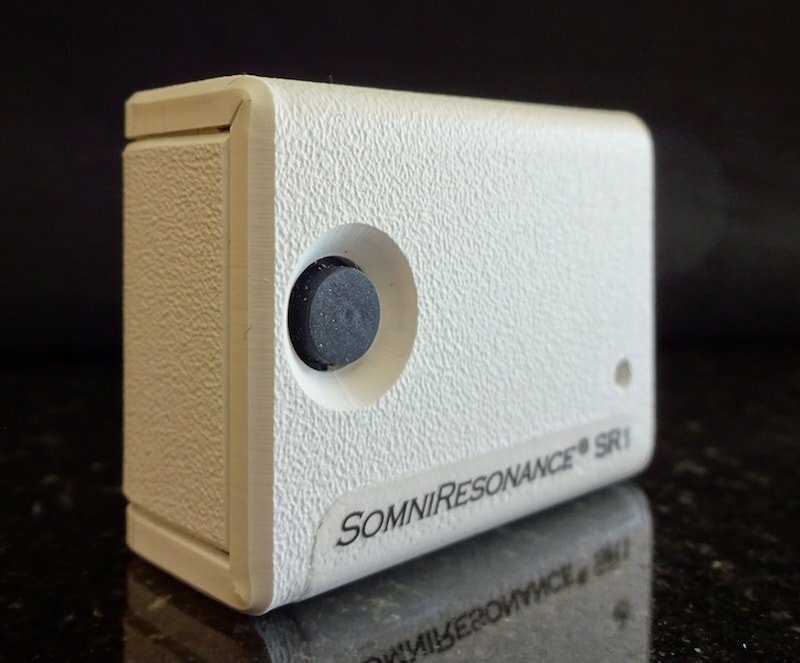 Whilst there are numerous different PEMF devices on the market, the SomniResonance SR1 is designed specifically for improving sleep. The SR1 is a small FDA Cleared medical device that’s worn on the body and delivers a weak pulsing electromagnetic signal to help induce sleep. The SR1 is different to other PEMF products in that the strength of the signal emitted is extremely low, around 0.5 Gauss. By comparison, the Earth’s natural electromagnetic force is between 0.25-0.6 Gauss, so the SR1 is considered well within the range of safety. The reason the SR1 can operate with such a low signal is because its designed to be worn directly on the body, in a very specific region on your chest, near your mid-collar bone area. This region is chosen because it sits over the brachial plexus, a major highway of nerves that extend from the spinal cord into the armpit. By placing the SR1 over the left or right brachial plexus, this major network of nerves acts as a carrier, delivering the SR1’s electromagnetic signal directly to the brain. The SR1 Delta Sleeper is so-called because it mimics the slow (delta) wave oscillations of deep sleep. By adopting these same frequencies the SR1 ”gently encourages the brain to fall asleep”. Operating the device is simple and straightforward. Adhesive patches are supplied with the device, which you use to attach the SR1 to your chest. Designed to be worn in bed, once the SR1 is safely attached, it’s a simple case of pressing the on/off button and lying down to sleep. After 22 minutes the unit automatically shuts off. The beauty of the SR1 is that there’s no limit to how many times you use it per night. So if you wake up in the middle of the night you can simply press the on/off button again to re-initiate the sleep-inducing signal. This is ideal for light sleepers and people who suffer from waking up in the middle of the night. 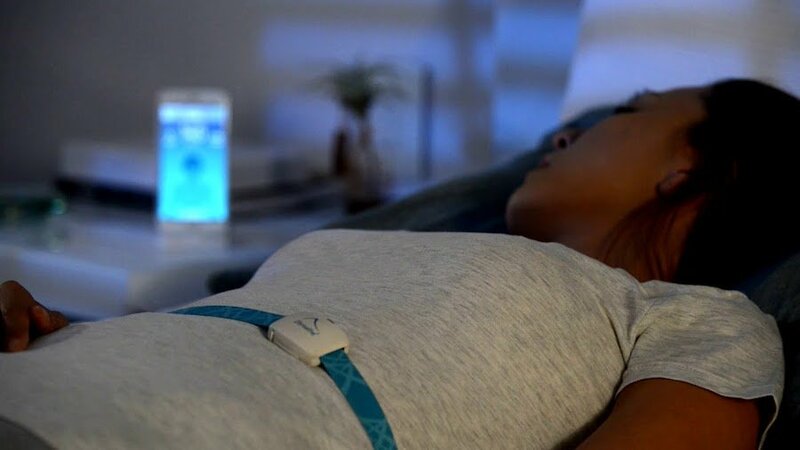 The curiously named, Dodow is another a hi-tech sleep aid from another French startup called Livilab. Since launching in 2014, over 300,000 users have fallen asleep with Dodow, falling asleep over 2.5 faster than normal, according to a company survey. Working like a metronome, Dodow projects a halo of blue light onto your ceiling.By synchronizing your breathing with the light – inhaling when the beam expands, exhaling when it shrinks – Dodow creates a hypnotic effect, like watching a pendulum which gently sends you drifting off to sleep. To use Dodow, simply tap the touch sensitive surface once for an 8 minute mode, and twice for the 20 minute mode. The device then projects a light onto the ceiling which less than 1 Lux, soft enough not to inhibit melatonin production. As you sychnronize your breaths with the pulsing light, Dodow gradually reduces your breathing rate from 11 to 6 breaths per minute. This stimulates what’s known as the baroreflex, a subtle physiological mechanism that restores the balance to your autonomic nervous system. The net effect is you gently pass from an alert, active wake state to a resting, drowsy state, ready for sleep. We hope you enjoyed our round up of hi-tech sleep aids. We’ll keep this page updated with any other exciting products that enter the market. In the meantime don’t forget to check out our Twitter feed for more updates in the world of cutting edge sleep gadgets.